﻿﻿This is the story you will read as you drive up and down Christmas Street in Taylorsville. 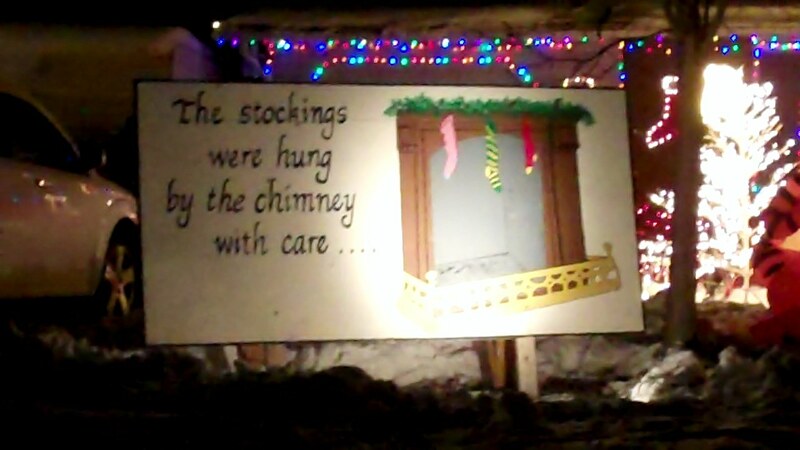 Each house has a billboard out in front of it that tells a different part of The Night Before Christmas story. Every house is decorated with decorations for the season. Kids of all ages will love looking at the lights, decorations, and reading the story. ﻿﻿Drive down 3200 West in Taylorsville. When you are close to 5400 South, you are going to want to watch for Royalwood Drive (5350 South). It is on the West side of 3200 West. Turn Westbound down Royalwood Drive (5350 South) and watch for Christmas Street on your left hand side. Christmas Street is 3310 West. Here is a short daylight preview of some of the things you will see on Christmas Street this year. FYI--We went to Christmas street tonight (Friday, Nov. 26th) at 7 pm and none of the lights were on. The decor was up, but nothing turned on. Hopefully they'll start sooN! Yay! It's so much fun when kids get old enough to get excited about lights and Christmas! Have fun! how late at night do they turn off? Are they still on? We want to go tonight!